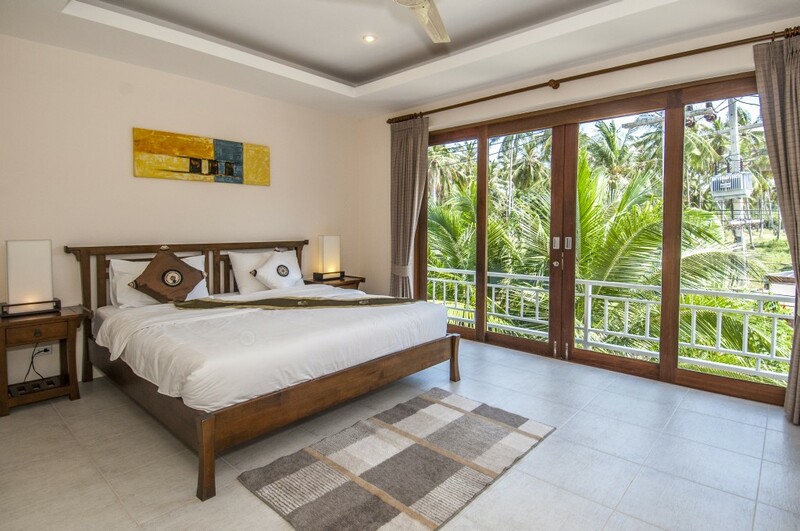 Boh Khung Villas are located on the north coast of Koh Samui and are the ideal Samui villa rental for discerning holiday makers or residents alike. 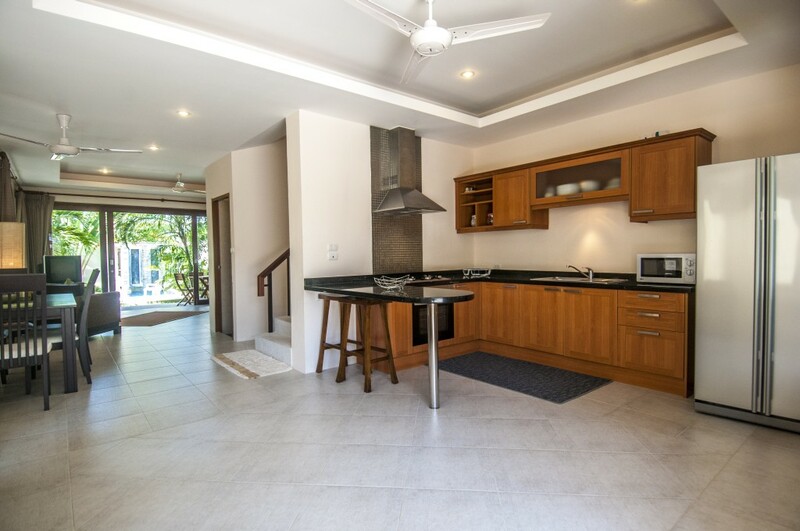 A short stroll from Big Buddha Beach finds these delightful 2 bedroom, 2 storey Samui villas conveniently located in Bang Rak, central to all island attractions and only a mere 5 minute stroll to the beach and a 5 minute commute to Chaweng. 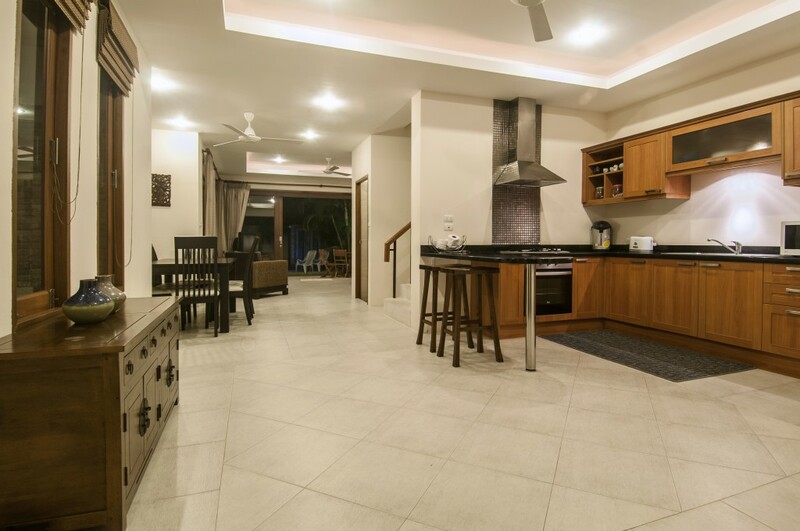 Set amidst a lush coconut groves, these Samui villas offer the perfect environment for that relaxing self catering holiday, without the restrictions and expense of a busy resort and offering you the privacy, space and comfort you seek on a vacation or for a long term rental on Samui. Complete with all the modern conveniences you would expect in a high-end home, these Samui villas offer private swimming pools for you to cool off on a warm sunny day, sun-loungers for those who seek the sun and an open plan design for ease of living and entertaining. Fully furnished throughout, our Samui villas provide comfortable self catering holiday rentals for small families, friends or couples seeking quality tropical living. 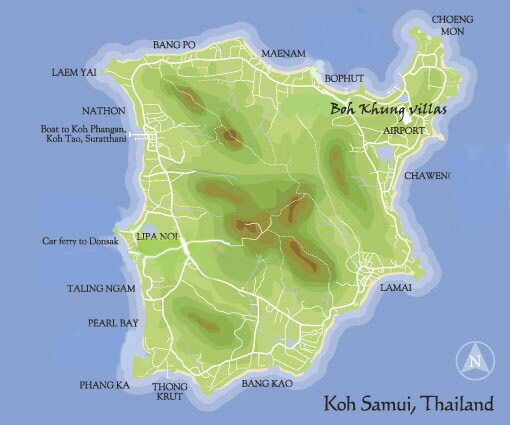 Koh Samui, is the third largest Island in Thailand, measuring 21 kilometers at its widest point and 25 kilometers in length, with a land area of approx. 280 sp.km and has a local population of a mere 34,000. Koh Samui is one of a group of 80 tropical islands Known as Angthong National Marine Park, where a stunning archipelago awaits to greet visitors with their tranquil palm-fringed beaches, crystal clear water and colorful coral reefs. The numerous islands make's it a perfect hideaway for vacationers from around the world. The ideal destination for many is Koh Samui, with its vibrant Nightlife and many Restaurants offering culinary delights from around the world. Koh Samui is the rare gem of the Gulf of Thailand. Conserving the idyllic simplicity of a tropical hideaway, it is mostly characterized by its powdery white sand beaches, crystal-clear waters. 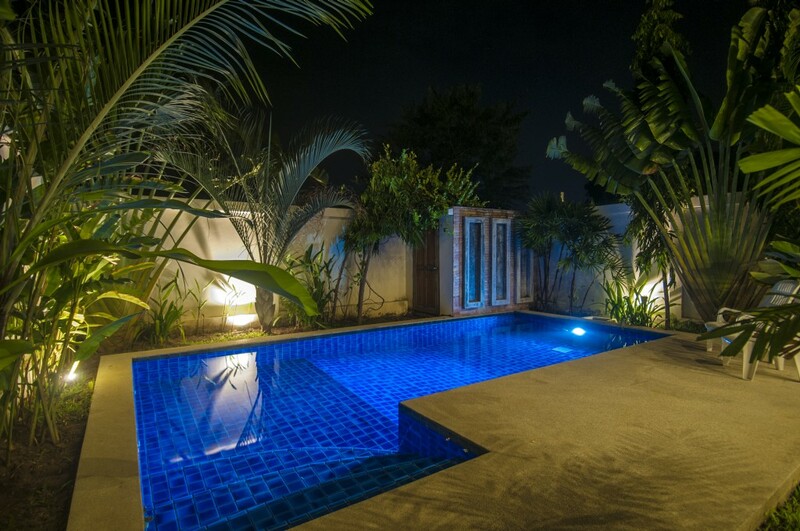 Boh Khung Villas are the kind of Samui villa rental you dream of if you are planning a tropical holiday: effortlessly stylish and offering total privacy to the outside world. 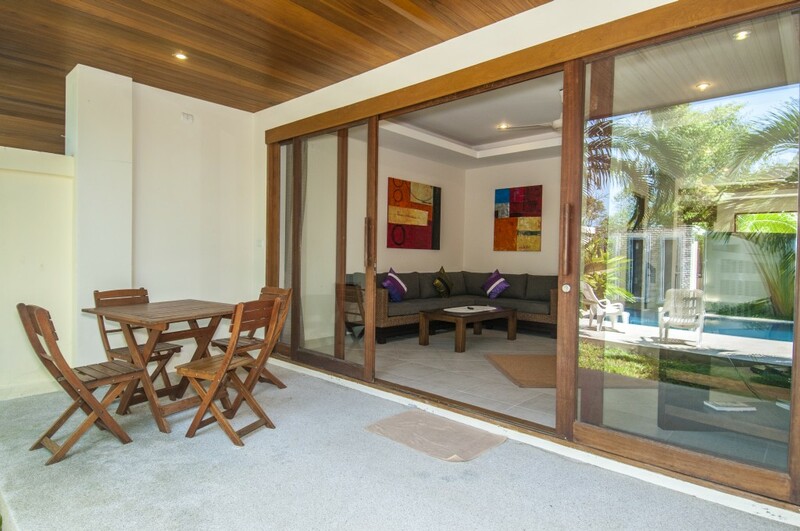 Once you step through the gate and onto the property, you find yourself in a warm and open space, ideal for spending time with family and friends. 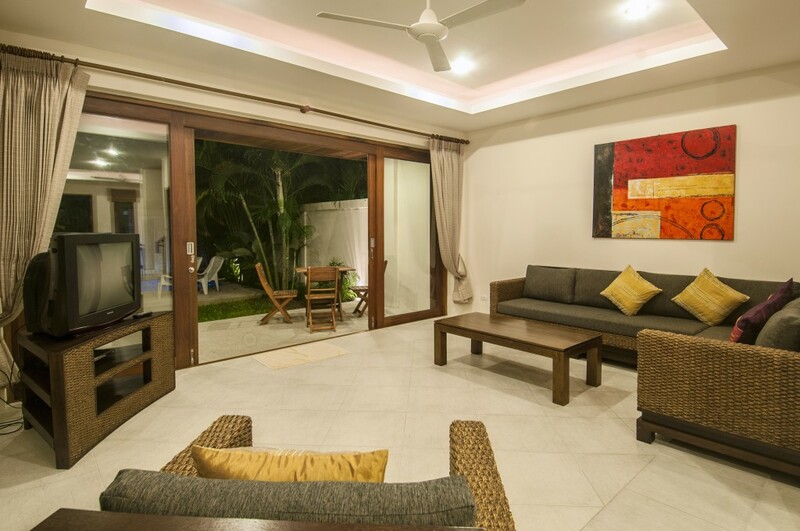 Convivial living is one of the hallmarks of Thai life and the architects who designed these Samui villas have deliberately created a light, airy domain where space flows and makes relaxation astonishingly easy. 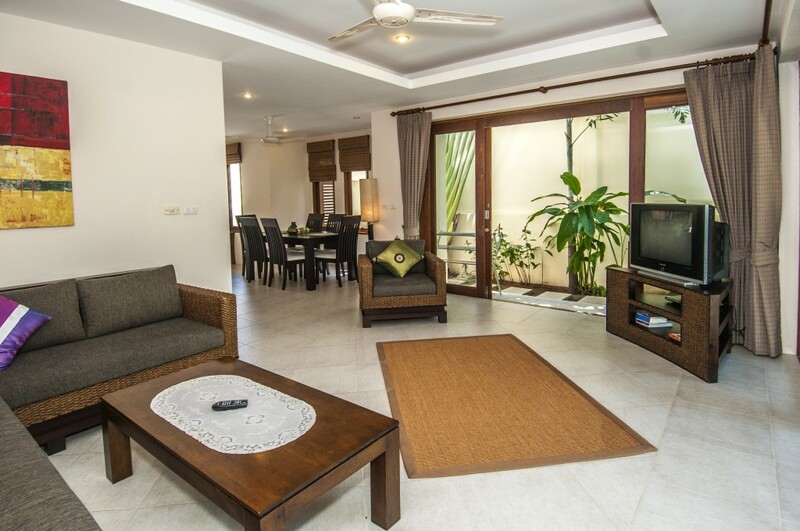 These Samui villas, with typical Thai grace notes are finely built and beautifully furnished throughout. 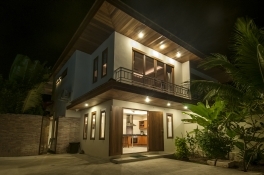 Sturdy tropical hard woods have been used to provide both comfort and practicality in the house and the warm natural shades promote a sense of well-being. 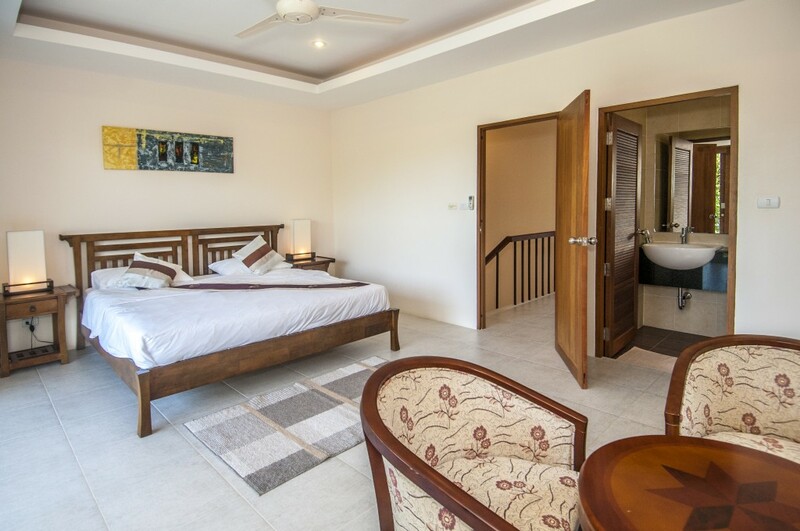 Luxury goes hand-in-hand with this type of dwelling and Boh Khung Villas are a haven of taste that is bound to appeal to the discerning holidaymaker. Rooms are never cluttered or over filled and the balance between decor and space has been finely observed. 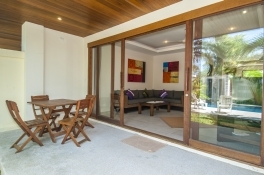 Long Term Rates and generous discounts available on request and subject to availability. 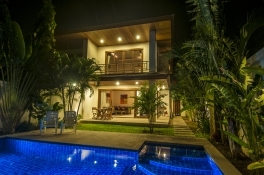 Minimum three night stay in our Samui villas. Peak Season 15th December - 15th January AND 15th July – 31st August. Each Samui villa sleeps a maximum of 4 people. Please note that rates exclude electricity and maid service options. Quiet and tranquil, just what we were looking for on our holiday and so much cheaper than staying in a resort. 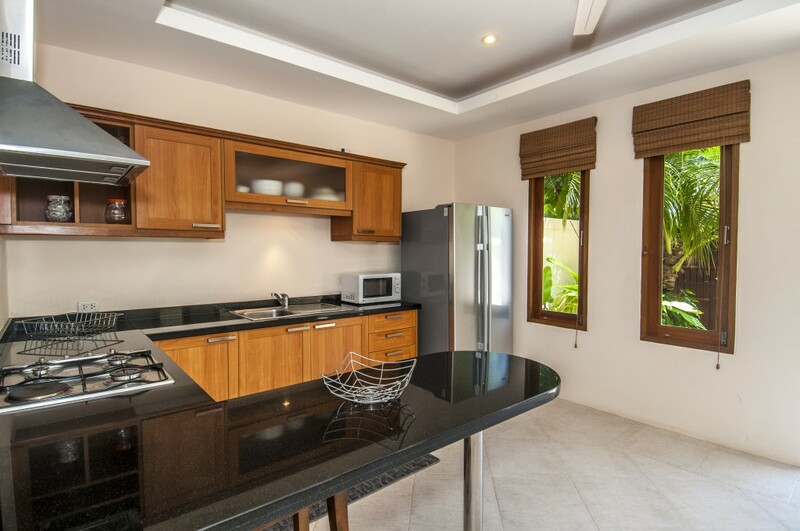 Management were lovely and I would highly recommend these villas to anyone seeking privacy and relaxtion!. 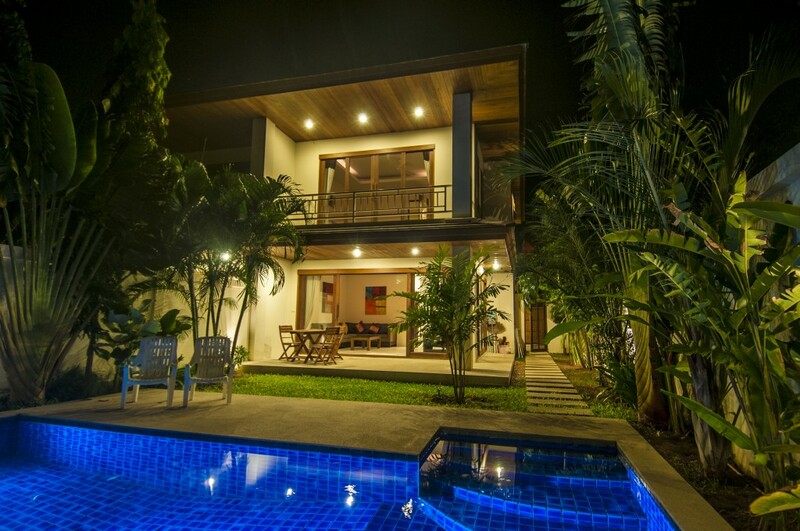 I have stayed in these villas twice in the last 12 months and have no regrets. 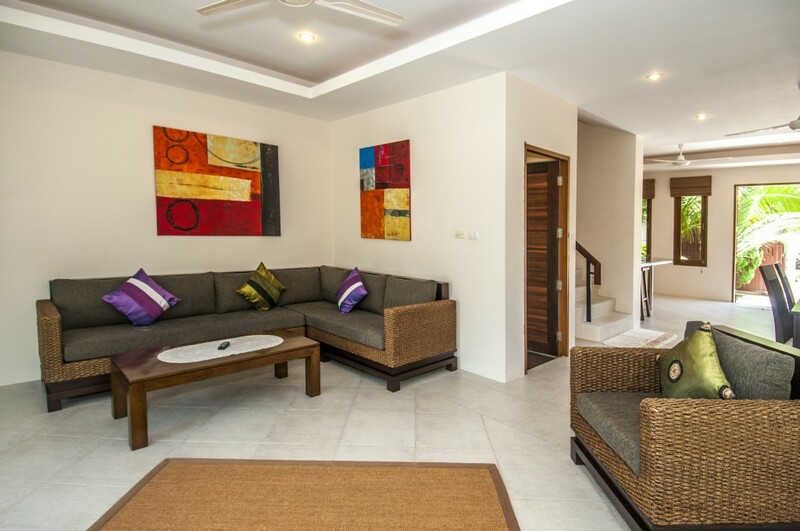 The villas and service are first class and built just over a year ago. Located on a quite spot and only 2 miles to the airport, Budda Beach less than 10 minutes walk away for a 83 year old (Me), Highly recommend. 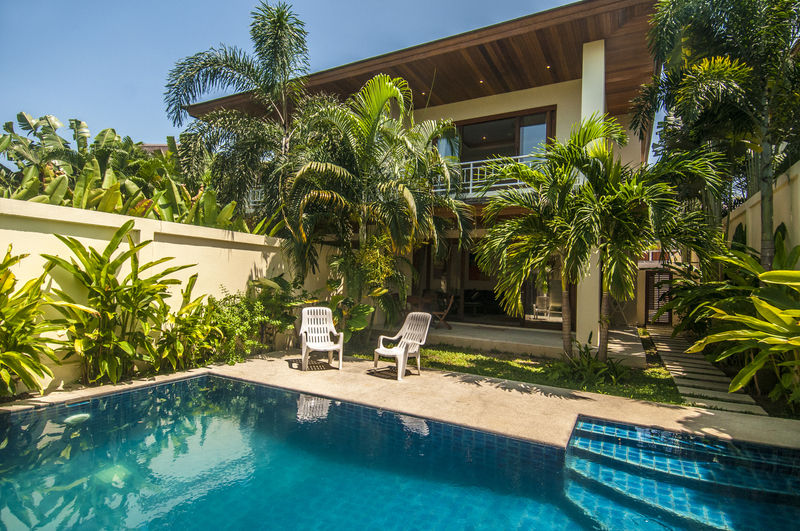 I have stayed several times at these villas and couldn't ask for more. 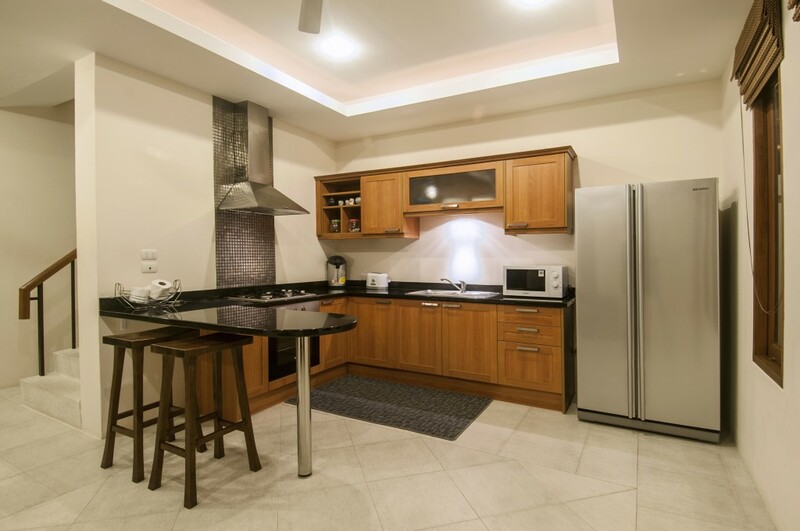 Two double bedrooms with en--suite, lovely functioning modern western style granite work toped kitchen, and private swimming pool. 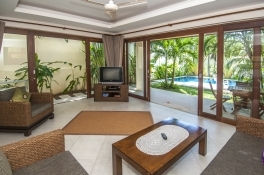 Located within walking distance to the beach and restaurants. Love the place and the staff. A security deposit will be applicable. Refundable upon departure. A copy of the guest´s passport or ID card will be required. All payments/rents made in advance as per agreement. No alterations or works or decoration to be carried out on the villas without written consent from Management. Any damage or breakages in the villas will be charged for at the replacement value. 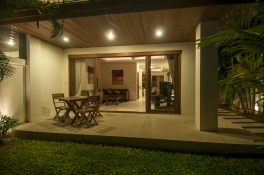 The Guest agrees to keep noise to a sensible level and consideration for other villa guests. 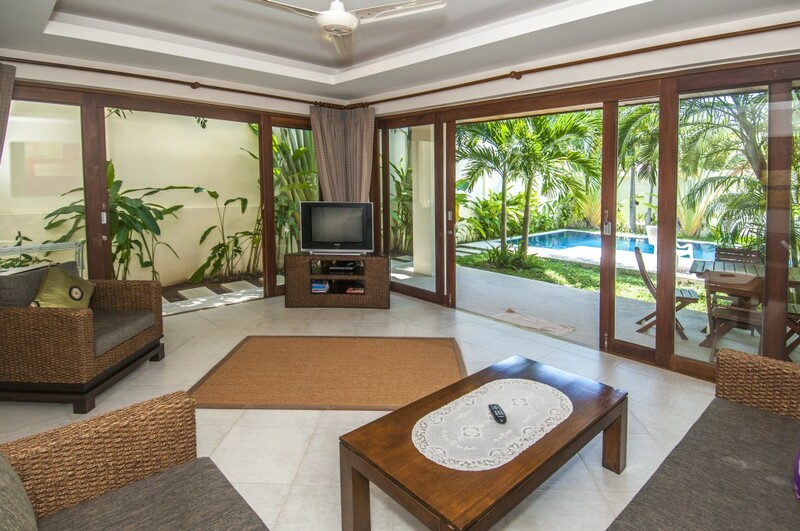 Any valuables left at the property are the guest´s sole responsibility. Management cannot be held responsible for any loss or damage of personal property. Safety. Please take care with the swimming pool and supervise any children for their safety. Management will not be held responsible for any personal injury or death on the property. Linen will be provided every third day for guests on Daily Rates only. 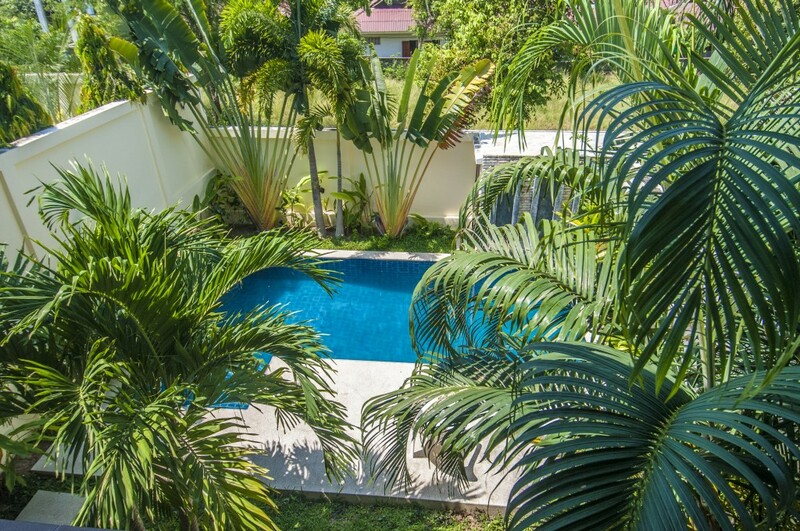 Gardening and pool maintenance will be provided free for Guests on Daily Rates only. 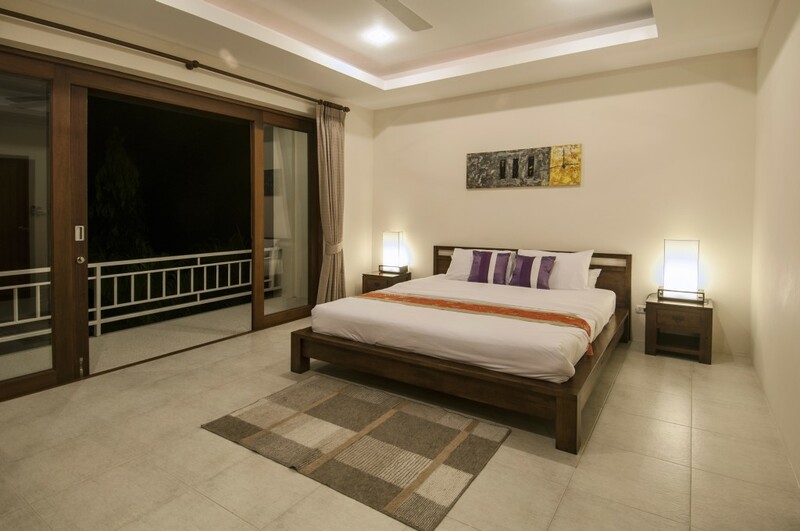 These services can be provided for long term guests for an additional cost. All Reservations to be paid with in 14 days to confirm booking. A cancellation refund will only be available (Less 10% Admin fee) if the booking is cancelled in writing within 90 days prior to arrival. Within 45 days (50% refund). Rental prices are subject to change at any time. Thank you for your valued enquiry we will reply to you as soon as possible. © Boh Khung Villa Rentals, 2015. All rights reserved.